A Full HD projector with native 1080p resolution is the ultimate prize for home cinema enthusiasts. And now you can pick one up for less than £900, thanks to the new abundance of Texas Instruments' precious hi-def DLP chipsets, and some aggressive pricing by manufacturer Optoma with the release of the HD20. It's hard not to be impressed by a full 1080p image blown up fill a nine foot screen and the HD20 certainly doesn't disappoint. 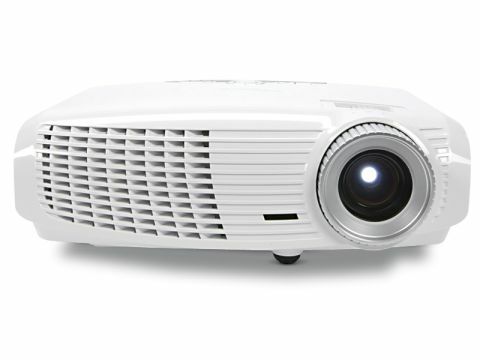 First I beamed a high-res digital JPEG to appreciate the closely packed pixels on the Dark Chip 2 that this projector is built around. The DC2 module is a venerable design, albeit one that has stood the test of time well. The device delivers a pleasing level of contrast which belies the budget nature of the PJ. In use it delivers a fine image, particularly with games consoles (increasingly a significant element of the affordable end of the projection market). Films fare well, too. Well-produced Blu-rays like Watchmen dazzle with detail. Moving images look well-defined, with crisper delineation and more solid colours than PJs that top out at 720p. The slo-mo opening credits gave me ample time to wow at the texture of the spent bullets on the floor. The projector can deliver plenty of hi-def detail – and that's crucial if you're watching on a really large screen. Watchmen also has its fair share of difficult dark scenes, which the HD20 struggles with at times. If your room has a fair amount of ambient light, you can use Optoma's Bright mode, but it's at the expense of contrast and black levels. Best to block out ambient light as much as possible and switch to Eco. Even so, some of the gloomiest sequences still remain lost in shadow, whereas a more adroit (and expensive) projector would resolve them a little better. The colour palette is understated, which makes for realistic skin tones, but at the expense of vividness. This unit is well made for a budget model, but don't expect more than the basics. There's no optical lens shift for example (only vertical keystone correction) and the zoom is limited, which makes this short-throw PJ quite fussy about placement. It couldn't focus on my screen from the back of the room, which means fixing it to the ceiling directly overhead, or plonking on the coffee table in front. This might suit some, but it does mean you're closer to the HD20's cooling fan. Optoma optimistically calls the HD20's 29dB operational noise as 'whisper quiet'. It's not. What could be more of an issue is DLP's rainbow effect, where your eyes perceive a blur of colour in front of the screen. Some people are more sensitive to it than others and I'm about average, but I did find it distracting here. Optoma, however, says its six-segment (RGBRGB) colour wheel system is the best option around for reducing the effect. Despite these criticisms, I'd have no qualms about recommending the HD20 to someone looking to step up from flatscreen to projection on a tight budget– it represents great value for money.